Internationally, it's an Online Shopping Bonanza: So why are we paying so much locally? IT software and hardware prices in Australia are so inflated (compared with other advanced economies) that the House of Representatives Standing Committee on Infrastructure and Communications initiated the Inquiry into IT Pricing. Yet IT pricing is only one of many issues in Australia's digital economy that keep prices up and online shopping, generally, is no exception. NBN propaganda asked us to think about "what you could do with super-fast broadband" (see video below). But what good is super-fast broadband if the Australian retail market keeps online shopping prices inflated? Will the NBN simply help people to buy more, cheaper goods from overseas? Let's look at the situation as it now stands. A pet store item from an online Australian supplier costs $129.00 with shipping for $6.99. The same item from an online UK supplier costs $74.46 with shipping of $8.99. A paperback Hemingway novel from the UK sells at $8.70 with free shipping; the cheapest Australian price for the same item from an online supplier was $15.80 with free shipping, or $14.99 with $5 shipping. Is this over-inflation of prices sustainable? Gerry Harvey's (of Harvey Norman fame) views are that buying cheaper goods overseas means that Australians lose their jobs, and he is so upset about it he publicly dobbed in his wife and daughter for shopping online "because it's a lot cheaper". But why wouldn't you? One of the biggest upsets for online shoppers in Australia is the cost of shipping goods bought online. I recently looked into purchasing a specialty item online where the cost of shipping from New York was USD$12.50 whereas shipping from Sydney to Canberra cost AUD$25, not to mention that the item from the US was AUD$100 cheaper. Surely something is not right with the Australian freight system? But Australia's postal system is open to competition, except for letters under 250 grams (reserved services), so there is no tangible impact of Australia Post's statutory monopoly on the cost of parcel deliveries. The service is usually pretty good too, and, from my own experience of online shopping, Australia Post's parcel tracking system is second-to-none. Further, the cost of shipping goods bought online is not regulated by the ACCC and delivery charges do not form part of the total item cost for advertising purposes, therefore, delivery charges are determined purely by market demand. But it still doesn't explain why the price is so high. It certainly isn't that Australians are any less likely to buy products online when compared with a similar country such as Canada (see figure below). 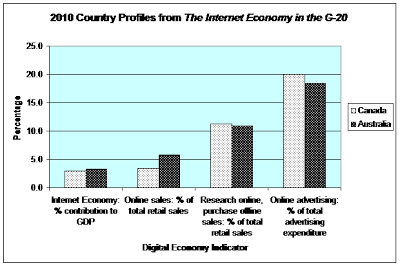 Indeed, Australia's Internet economy contributes more to GDP than Canada's, and Internet sales in Australia make up a larger portion of all retail sales. Why, then, does it still cost so much more to buy products online from overseas than it does locally? There are a number of plausible reasons. First, the Australian dollar is performing very well internationally, so overseas purchasing power is significantly better than five years ago. Nonetheless, currency fluctuations do not explain price differences of 50% and more from overseas suppliers. Second, Australian suppliers, simply because of the tyranny of distance, are less likely to have access to larger markets overseas, whereas it is much easier for a European or Asian seller to add Australia to its global reach. But this doesn't explain why Australians simply don't buy more overseas, forcing local prices down. Third, there are security concerns about buying from overseas. Buyers tend to be wary of online scammers and there is a great deal of fear-mongering about Net scams, particularly from overseas websites, despite the existence of various security measures for online purchases. Nonetheless, payment services such as Paypal and Escrow or paying with a credit card can provide significant protection if used intelligently and in combination with some simple online research. The myth that lower tariffs destroy jobs has been debunked. Trade liberalisation has made the economy more flexible. The number of people employed in Australia in export-related activity in services such as finance, property and business services is increasing. It would appear that the combination of factors outlined above contributes to the inflated online prices and delivery charges in Australia. As confidence in online shopping grows, it is unlikely that Australian suppliers will be able to continue to charge inflated prices for goods that are simply cheaper overseas. But how a delivery charge from Sydney to Canberra can cost twice as much for the same item to be shipped from New York to Canberra beggars belief. Put simply, the Australian market, with its "Iron Man" economy, can simply bear higher prices, and enough consumers are willing to pay over-inflated prices. 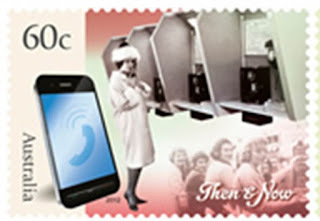 No doubt it is just a little while before Net-savvy consumers force the inevitable market correction.